Anyone who knows Kendra Tierney (wife, mother of 9, author and blogger at catholicallyear.com) knows her to be as gracious as she is inspirational. She, and her very dear family, really live a full Catholic life with generosity and joy, and that life is exemplified in the way they live out the liturgical year. 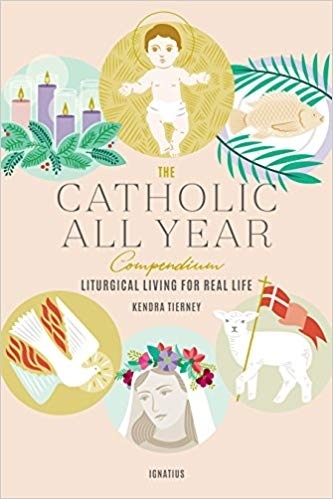 For any of us hoping to vivify our everyday lives with the numerous feast days, celebrations, and seasons of the liturgical calendar, her latest book makes it easy and fun. With a charming writing style and packed to the brim with creative, but accessible ideas, ‘The Catholic All Year Compendium’ truly is a valuable reference book for families. I sat down to chat with Kendra about her latest book. MERING: What did celebrating the liturgical year look like for you growing up? Or was it something you came to live as an adult? TIERNEY: I was baptized Catholic and we went to Mass every Sunday, but I didn't grow up with a devotion to the saints or really any understanding of Catholic culture or tradition. It was actually historical novels and BBC miniseries' that eventually introduced me to the idea of celebrating saints' days in community. Whole villages feasting and fasting together in honor of holy days and patron saints was fascinating to me. But it was still just a foreign concept. MERING: Why is celebrating the liturgical year of particular importance for you and your family? TIERNEY: As our family started to grow, the husband and I made the decision to actively promote a family culture. We knew we wanted to make demands of ourselves and our kids that were far beyond current cultural norms as far as morals, sacrifice, service, obedience, etc. But we realized that JUST expectations and demands were an incomplete picture of what Catholicism really is. It's also joy and feasts and hilariously macabre patron saints. It is our hope that by equipping our children with both sides of our faith, it will be such a part of themselves and their days that they won't ever leave it. MERING: What inspired you to write this book? TIERNEY: There are two classic books about living the liturgical year in the home, one by Maria Von Trapp (yes, THAT Maria Von Trapp) and another by Mary Reed Newland. Both were written in the 1960s. I read them as a young mom and found them at once inspiring and VERY intimidating. They just make so many assumptions of skills and supplies, that I just didn't have. It was a different era. So I used what they had done for their families in their circumstances as a jumping off point, but I really ended up making a lot of this up as I went along, to fit my life and times. Also, as I talk about in the introduction to my book, there is this hunger I saw in our world for community. There are all these national "days," so we can all eat pancakes together or talk like a pirate together or clean out our refrigerators together, and put it on social media. They're great. I've got nothing against them. But the more I delved into Catholic history, the more I realized that WE already had all these crazy traditions, we'd just forgotten about them. MERING: What are some of your favorite feasts or entries in the book? TIERNEY: Can I just pick a favorite kid instead? Saint day food puns are my love language, so I really get a kick out of serving Divine Mercy sundaes or St. Thomas s'mores. And I always enjoy the two king cakes we do each year, for Mardi Gras and Epiphany, where a kid gets crowned king or queen for the day, and the rest of us must do his or her bidding (within reason, or course!). But the things that have been most fun and meaningful for our family are things like the Christmas Novena and our little At Home Nativity Play, praying for the dead in a cemetery in November, vanquishing a devil pinata on Michaelmas, and an "It's a Boy" baby shower for the Annunciation. Epiphany King Cake: the rule is, if you find the baby Jesus in there (or bean or ring) you’re in charge of bringing the King Cake to the next gathering. They are a blast, and they are part of who our family is, and they've given us a deeper love for Jesus and the saints and the traditions and doctrines of the Catholic Church. Mering: As a busy lady how do you carve out time to write? Tierney: Lots of help, and a weird sleep schedule. I have very generous and supportive parents and a very understanding husband. I've got awesome older kids in the house, who can help with things like cooking and looking after little kids when necessary. And I've got a very good friend who, when book deadlines were looming, had my kids over to her house almost daily for weeks. So, if you are glad the book exists, thank Micaela Darr. As far as the regular accomplishing of things like art and writing and home projects, I manage those by having adopted a Thomas Jefferson-inspired segmented sleep thing. I get up in the morning with the kids, and see the oldest four off to "regular" school. I spend the morning homeschooling the middle three and trying to keep the two little guys out of trouble. After lunch, the little kids nap, and so do I, for an hour or two. In the afternoon is errands and chores, then dinner and family time and bedtime. Once the kids are in bed, I start my workday. If I've got a project going, I'll often work from 7 or 8pm until 2am or so. But with the nap, I find that's enough sleep. Between projects, I sleep more and get caught up if necessary. For me it's just been an example of God equipping us with the tools we need to correspond with our gifts! Thanks, Kendra! You can purchase ‘The Catholic All Year Compendium’ here.